As Seen on Show and Tell: #TeamValor Light up badge for #PokemonGo #WearableWednesday « Adafruit Industries – Makers, hackers, artists, designers and engineers! Thanks to Orlando for sharing his awesome Pokemon Go Team Valor badge on Show and Tell! Check out the Instructable for the project here. Since Pokemon GO came out, I’ve wanted to make something to related to the game. 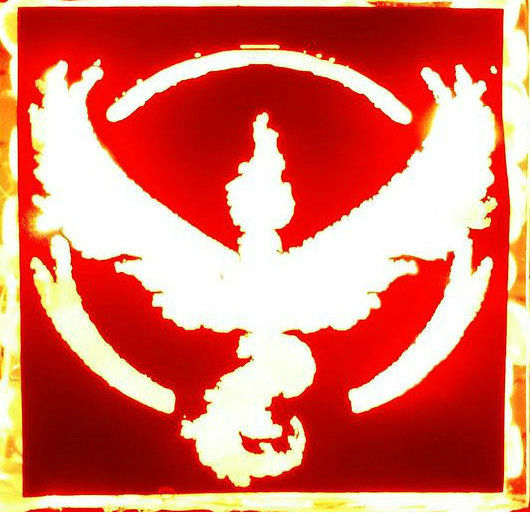 I wanted something I could make in an afternoon that I could use right away, so I thought of a blinking Team Valor badge to represent the best team in Pokemon GO. The circuit is simple, I am using a square wave oscillator that is driving an NPN transistor which lights the LEDs. The real challenge comes in the enclosure. I laser cut a cut-out of the Team Valor Emblem and glued it to one side of a piece of non-glare acrylic. When the LEDs turn on, the emblem is displayed in all its glory.